Sometimes the only thing that can cure a craving is, well, indulging in it! Whether it’s a craving for some homemade spaghetti like Grandma used to make or for some gourmet seafood pasta dishes, these Nebraska restaurants are sure to be the antidotes for that pesky craving. Malara’s has been family-owned and operated since the early 1980s, according to its website. That’s a good start for finding something everyone’s taste buds are looking for—homemade pasta. Caterina Malara began her restaurant by offering authentic Italian dishes, visit there today and you won’t be disappointed. Malara’s offers a plethora of pastas: angel hair, mostaccioli, 100 percent whole wheat pasta, gluten free pasta—and the two everyone has been salivating for—homemade spaghetti and homemade spinach spaghetti. Bruno’s surpasses them all. They make all of their noodles in-house at Bruno’s from scratch. That includes but isn’t limited to the orecchiette, the linguine, the gemelli and the rigatoni. Bruno’s is unique because they offer an old-school homemade dish with a modern contemporary flavor. Thanks to Executive Chef AJ Swanda. True to their word, Bruno’s motto is “Old World, New Style,” according to its website. With three locations, Sgt. Peffer’s has its pasta recipes down pat. Peffer’s has all the classics, and they keep them that way. Pick a pasta and a sauce to go with it, pasta pleasure is only a mouthful away. Offering signatures pastas, classic pastas and baked pasta, there’s almost too much to choose from. Trust Sgt. Peffer’s, they know pasta. Mamma Mia, it’s a spaghetti restaurant! With a few other pastas available of course. The Old Spaghetti Works offers not only its namesake—spaghetti—but also fettuccine, bow tie, angel hair and penne pasta. Pick a sauce, any sauce. Stick with the classic marinara or pesto, or if feeling a little risque try the beer cheese or spicy Italian. No matter the choice, the Old Spaghetti Works will satisfy a pasta craving. Vincenzo’s has been voted “Lincoln’s Top Italian Restaurant” by the Lincoln Journal Star, according to its website—an honor that isn’t taken lightly. While Vincenzo’s does have two locations, it’s still a locally owned business. 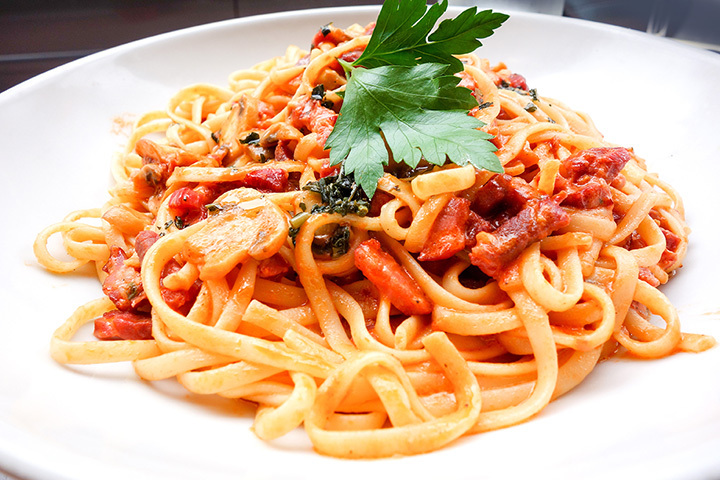 Offering both lunch and dinner pastas, Vincenzo’s range of pasta outdoes the corporate chain restaurants. Try the pacchetti, the diavolo, the primavera, the ravioli—return a second time and try a new dish or an old favorite. Complete with an Italian flag for outside decoration, Napoli’s will transport customers straight to Italy. Napoli’s sports a standard dinner menu along with rotating menu specials—the standard menu offers all of the classics while the rotating menu tries out new recipes. At affordable prices try the manicotti, the lasagna, or hey maybe you can’t decide on just one—try the pasta sampler. Luigi’s website lets the customers know their food is made with homemade recipes and passion—the two best ingredients. Take a “Tour of Italy” at Luigi’s and sample the fettuccine, alfredo, chicken parmigiana and lasagna all in one dish. At an affordable price point, Luigi’s makes family food with family recipes, so stop at a Luigi’s and feel as if you’ve come home. With a special story and history, Valentino’s offers a welcoming atmosphere and a down-to-earth motto, “Community service is as important as the quality of the food.” Customers are never strangers at Valentino’s. Visit Valentino’s to experience delectable pasta along with friendly service that leaves you feeling as if you never left home. Lansky’s is known for its homemade pasta dishes including the meat sauce lasagna and the chicken alfredo, according to its website. While tried-and-true dishes are always a menu go-to, there’s always a risk taker in the group. Try the beer cheese lasagna at Lansky’s if you’re feeling daring. If classic is more your style Lansky’s has all of the favorites—pesto, marinara and alfredo. Bella Vita’s name explains it all—meaning “good life” or “good times.” Visit historic downtown Elkhorn and enter Bella’s 100-year-old brick building to enjoy an authentic Italian experience. Bella Vita has it all, tortellini, gnocchi, ravioli, and of course—fettuccine alfredo.